A lot of us are familiar with monthly observances like October, for Breast Cancer Awareness Month but many of us are unaware that March is National Credit Education Month! 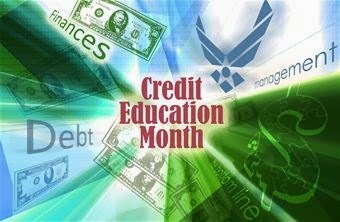 In spite of this monthly observance, we will be posting credit tips and advice all month long. Everything from the basics of building your credit all the way to mastering a perfect credit score will be found on our RANLife Blog, updated weekly. Credit. You constantly hear about how important it is. It's a number, no one really knows what it means, but it matters when trying to obtain a line of credit. Your credit history is essentially a record of your ability to repay money you've borrowed. Therefore payments made on time help boost your score and delinquent payments will decrease. It's just like a regular credit card, however, it is held by a security deposit that you put down anywhere usually between $300 and $500. Your credit limit is often this amount or a percentage there of. It's common for people to confuse a debit card and a credit card. A debit card, provided by banks, does not report to the credit bureaus. A debit card is merely a simple way to access funds in your bank account. There are three major credit bureaus that track credit history; Experian, Transunion, and Equifax. If information is not being submitted to at least one of these three bureaus it is not taking any effect on your credit score. Start small. The point of having credit is to prove your ability to pay back debt. Your goal is to prove to creditors and lenders that you can responsibly handle your finances and money borrowed. Even if you can only afford to charge $15 and then pay it back off it will still make a difference on your credit worthiness. If you haven't figured it out, it's not just enough to open up a credit card to keep on hand. You need to be using it, charging small balances, and paying them off in order for it to report to the bureaus. The golden rule is to never charge more than 50% of your cards limit and keep your balance somewhere between 10% and 30%. This rule is huge! Even one delinquent payment can drastically reduce your credit score. Even if you miss your payment date by a few days still hurry to pay the bill. Most delinquent payments won't report until it is a full 30 days late. You want to build credit score and you're getting excited but don't go applying just anywhere for a line of credit. Each time you inquire about a new line of credit that creditor reports it to the bureaus and you take a small hit from it on your credit score. Whether you are granted the line of credit or not it will show up on your report and multiple inquiries will bring down your score vastly over time. You have to first prove that you can handle one line of credit before anybody is willing to give you five lines. Use the secure credit card for at least six months before going to apply for anything else. After six months of on time credit card payments check your credit score online by pulling a tri-merge report (meaning all three credit bureaus). There are a few sites that let you check and manage your credit report for free, check out one by clicking here. First take a look at your score. Most lenders will consider the middle score of your three credit bureaus, this is known as your midscore. Your credit score can range anywhere from 350 to 850. You typically need over a 600 to get a home loan and over 750 is considered very good credit. If you're interested in checking your credit score in order to pre-qualify for a loan, please click here to fill out an application and get a copy of your credit report for free. After one year of following all of these steps you should be ready to apply for a regular credit card. In a lot of cases your creditor of your unsecured card and switch it to an unsecured card for you without having to get a new one. If not, try applying for a credit card through your local bank. There are also credit cards where you can earn back rewards such as travel credit or gift cards. Check out your options and decide what is best for you.